Aviation market in South Asia is among the fastest growing in the world. It is soaring in terms of both domestic and international travel. Last year, the Indian commercial aviation market grew to 176 million passengers and Pakistan's reached 22 million. A total of 22 million passengers (7.2 million domestic, 14.6 million international) flew commercial airlines in Pakistan in 2016-17, up 5.11% from 20.7 million (6.95 million domestic, 13.76 million international) in 2015-16, according to Civil Aviation Authority (CAA). While Pakistan's international aviation market as a percentage of its population is bigger than India's, the Indian domestic market is far outpacing Pakistan's mainly due to greater competition and significantly lower airfares. Nearly 15 million international passengers flew in and out of Pakistan in fiscal year 2016-17. This number is about a quarter of the 59 million international passengers who flew to and from India in roughly the same period, according to data available from the aviation authorities of the two South Asian countries. India's population is about six and a half times larger than Pakistan's. Pakistan's state-owned PIA carries 3.2 million international passengers giving it only 22% market in the country's international aviation market. Other major international carriers flying in and out of Pakistan are Emirates (2.2 million), Shaheen (1.57 million), Air Blue (1.4 million), Saudi Arabian and Qatar (1.1 million each). The difference in domestic air traffic between the two countries is far bigger compared to the ratio for international traffic. India has seen its domestic air travel market soar to 117 million passengers versus Pakistan's 7.2 million in 2017. India's combined aviation market for both domestic and international travel is 176 million versus Pakistan's 22 million passengers. 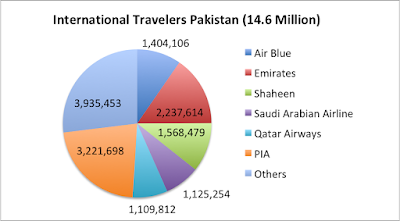 The other difference in terms of domestic markets of the two nations is that the state-owned Pakistan International Airlines (PIA) enjoys massive 67.2% market share while the state-owned Air India has only 14.2% India's domestic market share and the rest of the market is divided among IndiGo (38.2%), Jet Airways(15.4%), Spice Jet(13.8%) and other smaller domestic airlines. 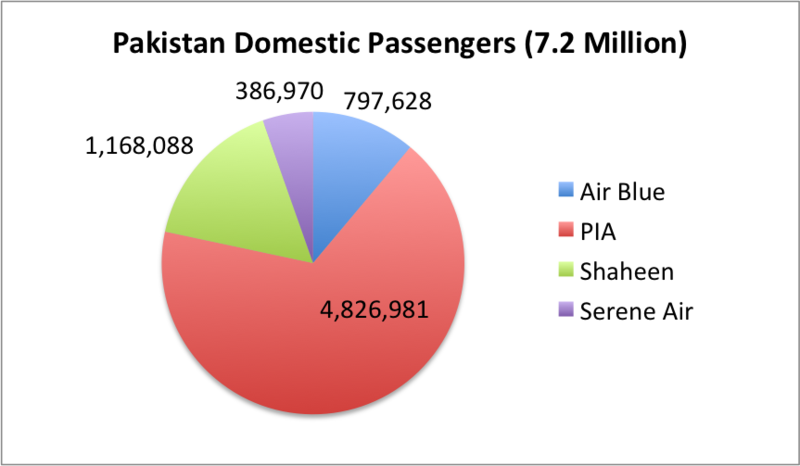 In Pakistan, Shaheen (1.17 million), Air Blue (797,628) and Serene (386,970) have the remainder of the domestic market. As to the reason for India's domestic market being 16 times larger than Pakistan's, let me quote the UK's Financial Times as an explanation: "A highly competitive domestic aviation market (in India) means that a passenger looking to fly from Delhi to Mumbai on July 1 this year, for example, can pay as little as $35. In Pakistan, someone wanting to do the roughly equivalent trip from Islamabad to Karachi will probably have to fly with the government-controlled Pakistan International Airlines and pay at least $100 to do so". Given the basic price-demand elasticity, it makes sense that Pakistan's domestic airfares being three times higher than India's reduce air travel demand to a mere 3.5% of Pakistan's population versus India's 8% of its population. "Flying in Pakistan is unlike anywhere else I have been — and the polar opposite to flying in India, where I live. Departing from any of the three major Pakistani cities is the closest a modern traveller is likely to get to experiencing what flying was like in the 1950s. Checking in is effortless and there are no queues at security. At Islamabad airport, you do not even have to go to your gate: you can sit in the café until your flight is called and then leave via a downstairs door that takes you straight on to the tarmac and a waiting minibus. Just hours earlier, I had suffered the regular indignity of catching a flight from Delhi airport. It took 20 minutes of disorganised queueing to check in, and another 30 to get through security. Getting on the aeroplane, as usual, reminded me of warfare at the Sino-Indian border, where troops are unarmed and so fight by jostling each other using only their torsos". Commercial aviation business has become much more cut-throat in recent years. It all began to fundamentally change with the passage of the 1978 US Airline Deregulation Act that made it easier for low-cost airlines to enter the market. Regulations mandating minimum fares no long applied. Since then, many other countries, including emerging economies, have adopted legislation similar to the US airline law. Some of the big name airlines of yesteryears like Pan Am, TWA and Eastern Airlines have died. Number of airline passengers across the world has increased dramatically as air fares have plummeted. Deregulation has forced state-owned airlines around the world to either shut down or seek big government subsidies to stay in business. Running a successful airline business now requires different management skill sets and efficiencies in the current deregulated and highly competitive environment. Part of it is technology driven transformation that enables minimizing staff and aircraft time on the ground, higher fuel efficiency and dynamic pricing based on demand. Unfortunately, state-owned airlines are finding it extremely difficult to operate in this environment. Most of them, including PIA and Air India, incur huge losses year after year and require substantial tax-payer subsidies. I saw an example of poor management of Pakistan International Airline (PIA) a few days ago when a friend posted a picture of nearly empty cabin on a PIA flight from Karachi to Lahore. There were rows and rows of empty seats which is a rare occurrence in the airline business these days. Efficient airlines use yield management software to cut fares dynamically until their flights reach capacity. Flying even one empty seat is seen as a problem by professional airline managers. The other serious issue facing PIA and many other state-owned airlines is that their staffs are not recruited based on merit. It is reported that even the senior managers lacks professional experience of running a commercial airline. Instead, the PIA jobs are doled out as part of the political patronage system that gives favors to the supporters of the ruling politicians. Aviation markets in South Asia are growing rapidly in terms of both domestic and international travel. Last year, Indian air travel market grew to 176 million passengers while Pakistan's reached 22 million. While Pakistan's international aviation market as a percentage of its population is bigger than India's, the Indian domestic market is far outpacing Pakistan's mainly due to greater competition and significantly lower airfares. Pakistan needs to take a page from the Indian playbook to increase competition and lower prices in the aviation market. This will expand the market, create jobs and make air travel more affordable in the country. It may be bcz of geography and kind of population density. I shuttle btw Faisalabad and Peshawar and there is no flight in btw bcz no demand of it. Omer: "It may be bcz of geography and kind of population density. I shuttle btw Faisalabad and Peshawar and there is no flight in btw bcz no demand of it." Additionally, India has many rail corridors throughout tier 1 and tier 2 cities. For example, Shatbdi Express from Ahmedabad to Mumbai, 500km is about 6 hours and very comfortable hassle free in business. I learned that many locals especially families use these corridors because it is cheaper for families than air travel. With the opening of new Islamabad airport..we are poised to take off..Musharraf's dream come true..
" But I do think the bigger reason for it is Pakistan's domestic air fares being 3X higher than India's for same distance"
That is also true for price of car , motorcycle, prescription drugs and practically every middle class item, except may be home rents etc. It is due to economies of scale and the sad part is that it is self full-filling. Not really Pakistan does not have the variety of Indian car market but some cars like Toyota corolla are at par or cheaper in Pakistan than in India. India's Civilian Aviation Market Fiscal Year 2017 was 242 million of which 54 million is international. Non transit passengers flying to Nepal and Sri Lanka are classified as domestic. The Pakistan International Airlines has leased or owned the Roosevelt Hotel since 1979 and has several times since sought to get rid of it. And sans sale, the overseas owners refinanced the debt on the property, records filed with the city Thursday show, with a $105 million loan from JPMorgan Chase. JPMorgan Chase’s refinancing replaced $140 million in previous debt on the hotel issued by Wilmington Trust, a subsidiary of M&T Bank. PIA did not immediately respond to requests for comment and JPMorgan Chase declined to comment. Built in 1924, the 600,000-square-foot hotel, located at 45 East 45th Street in the recently rezoned swath of Midtown East, is not landmarked and is a prime target for demolition and office tower construction, making the site worth hundreds of millions of dollars. So what’s held up a sale? Politics in Islamabad. In December, Pakistani Prime Minister Shahid Khaqan Abbasi rejected a selloff plan for the Roosevelt, according to the Express Tribune, an English-language paper in the country. PIA, a government controlled company, had come up with the plan as part of a larger strategy for paying off roughly $5.3 billion in debt. “Apart from being a valuable property, the hotel also carries cultural significance for Pakistan,” Abbasi said in rejecting the PIA plan. PIA last put the hotel on the market in 2007, asking $1 billion. In August, The Real Deal reported that an investment group led by hotelier Shahal Khan was interested in acquiring the hotel. Khan is also making a bid for the Plaza Hotel on Fifth Avenue. The new airport is capable of serving nine million passengers and 50,000 metric tonnes of cargo annually; expansion plans target servicing about 25 million passengers by 2025. “The current annual turnover of passengers at the Benazir Bhutto International Airport is about 4.5 million. The number of passengers is growing by 14 per cent annually as compared to national air passenger growth rate of less than four per cent,” Civil Aviation Authority (CAA) Deputy Director General Amir Mehboob was quoted by the Tribute as saying. The airport comes with a bill of more than Rs100 billion ($861.5m; or Dh3.15 billion), and is connected to both Rawalpindi and Islamabad. Level 1 - international and domestic passengers’ arrival area, baggage collection and airline offices. Level 2 - domestic arrivals and departure lounges, visitors’ gallery and immigration counters. Level 3 - international and domestic check-ins and international departure. The airport has contemporary design inspired by traditional Islamic geometric patterns. Environmentally-sustainable design strategies have been employed with the use of day light and sun shading to reduce energy use. The interior texture of granite flooring has been used to ensure dust-free air quality. The new airport is expected to be boon for both airlines and passengers and help lessen the bottlenecks in commercial aviation in the Pakistani capital. Around 1,200 Airport Security Force deployed at 85 security towers to ensure safety at the airport with advanced security management systems and two bomb pit facilities. With the launch of new airport, Pakistan is all set to welcome foreign tourists who primarily come to visit the scenic northern areas or to participate in religious festivals. Pakistan Tourism Development Corporation (PTDC) has announced to establish a modern Tourist Information Centre at the new airport, said PTDC managing director Chaudhry Abdul Ghafoor Khan. Pakistan is not only rich in Islamic heritage but also a gateway to sacred sites for other religions especially Buddhists and Sikhs. Many holy sites for Sikhs such as the birthplace of the founder of Sikh religion in Nankana Saheb district, and Gurdwara (monastery) Punja sahib are in Pakistan. Similarly, the monastery Takht-i-Bhai (Throne of Origins) and the 3,000-year-old Taxila of the Gandhara Valley Civilisation are revered sites for Buddhists and attract pilgrims from China, Korea, Thailand, Malaysia, Japan and Sri Lanka. ... amid the street party scenes, wedged between the stalls heaving with sweets and succulent and spicy kebabs, another stall was showcased and getting a great deal of attention from local merrymakers: A funeral home’s stall. It gleams, it glistens, it positively glows. It's Islamabad's new airport! The new Pakistan international airport cost more than double the original budget, and its construction was repeatedly stalled for years amid rumors of financial irregularities. It was built miles away from anything, including the capital Islamabad, with no public transport available. Until last month, it still had inadequate drinking water, and some aviation systems still needed tests, postponing its inauguration yet again. None of that seemed to matter this week, when the mammoth, ultramodern, $105 million facility finally opened in rural Punjab province. The first arriving flight from Karachi touched down Tuesday morning, under an arc of spray from twin firetrucks, and the pilot waved the national flag from the cockpit. On Thursday, families waiting for flights oohed and aahed at the vast marble floors and glass walls and took selfies in a landscaped picnic park. Plane crews shook hands with baggage managers. Arriving passengers grinned at glitches, such as being left mistakenly outside a locked terminal door, that would normally have had them fuming. “This is so beautiful and new. It’s like a dream — no pollution, so much space,” marveled Abdul Rahim, 40, a United Nations employee who had just arrived on a flight from Kabul that would previously have landed at the small, aging terminal in Rawalpindi city that served the capital area for decades. “It will be good for repairing Pakistan’s image,” he predicted. Pakistan, a vast but impoverished country, has long been isolated abroad as a dangerous haven for Islamist insurgents and starved for positive recognition. Its few bragging points included a 170-mile highway and the testing of a nuclear device, popularly known here as the “Islamic bomb” but greeted far less kindly by the world community. This time, virtually everyone is hoping the impressive new Islamabad International Airport, a four-level complex with a smorgasbord of consumer amenities and high-tech passenger services, will be Pakistan’s ticket to revived global prestige and access, offering an attractive gateway to a scenic, mountainous country that has suffered a steep drop in foreign visitors during the past two decades of conflict. The airport is the nation’s largest, able to accommodate 9 million passengers a year and potentially expand to almost triple that capacity, officials said. It is also the first airport in Pakistan that can accommodate the double-decker Airbus A-380, the world’s largest passenger plane. 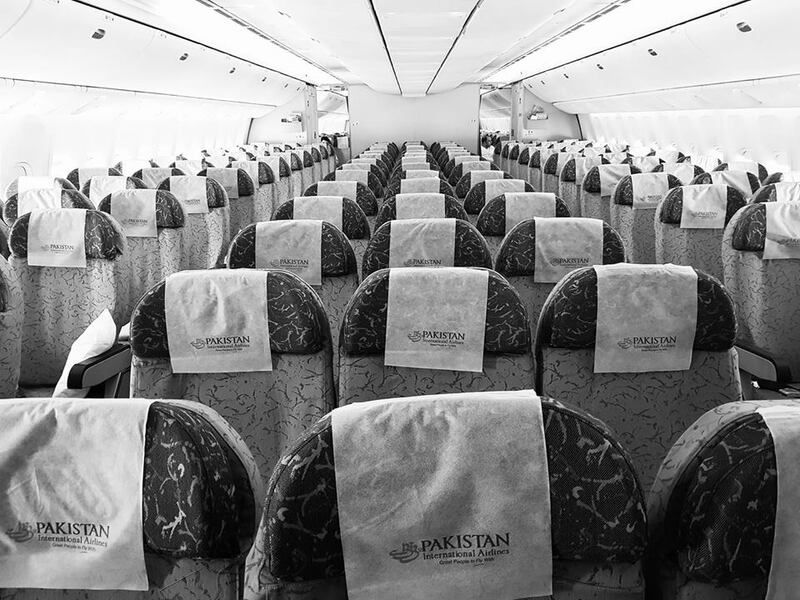 The ambitious expansion comes as Pakistan International Airlines, the country’s once-thriving national carrier, has become mired in financial difficulties and mismanagement and now possesses only 32 registered aircraft. Its future is uncertain, and various proposals to privatize or sell it have been inconclusive. Pakistani Prime Minister (PM) Shahid Khaqan Abbasi on Tuesday inaugurated the long-delayed new airport in the capital, Islamabad, replacing the cramped Benazir Bhutto airport often criticized by travellers. A Pakistan International Airlines pilot waved a green and white Pakistani flag out of his cockpit window after landing the carrier’s first commercial flight at the New International Islamabad Airport. With a sleek glass-front entrance, spacious check-in areas and jetway bridges for boarding, the Y-shaped airport promises an end to the congestion that has frustrated air travel in the past. “This airport rightly reflects what has happened in Pakistan in the last five years,” said Abbasi. Abbasi’s ruling Pakistan Muslim League-Nawaz (PML-N) party had been eager to open the new airport before national polls, likely in July, as it touts big-ticket infrastructure as sign of economic progress in the South Asian nation of 208 million people. Abbasi’s government is spending billions of dollars on upgrading Pakistan’s transport infrastructure and ending energy blackouts, with freshly paved motorways as well as dams and power plants popping up across the country. Abbasi, who has a pilot’s license and is a founder of a Pakistani budget airline, said new airports in the cities of Multan, Faisalabad, Quetta and Peshawar were in the final stages. The new Islamabad airport, which has the capacity to handle 15 million passengers annually and space for further expansion, was first suggested in the 1980s and has been more than a decade in the making. The delays have become a running joke with many Pakistanis, who mock the frequent announcements that the new airport would open soon and subsequent clarifications of further delays. The airport’s most recent delay was last month. “Nothing is impossible but this project definitely seemed impossible,” quipped Abbasi, in reference to his government inheriting the project in 2013. The new airport is about 15 km (nine miles) from the capital. Benazir Bhutto airport was in the nearby city of Rawalpindi and attached to a military base. International travellers often complained about chaotic scenes at the airport and in 2014 it was voted the worst in the world by the “Guide to Sleeping in Airports” website, prompting widespread criticism of the airport in Pakistani media. The new airport started full operation on Thursday. Shares in Jet Airways, one of the country's biggest carriers, plunged 7% in Mumbai on Friday following media reports that the company barely has enough money to make it through the next two months. The stock has lost more than 60% of its value since the start of this year, even as it spends billions to try and compete in the world's fastest-growing aviation market. In a statement sent to CNNMoney, Jet Airways CEO Vinay Dube slammed the media reports as "incorrect" and "malicious." Dube said the airline was implementing measures to boost revenues and cut costs, and that the company was in talks with its employees. "Some of these [efficiencies] amongst others include sales and distribution, payroll, maintenance and fleet simplification," he added. India's Economic Times reported that employees were being asked to take pay cuts of up to 25%. More than 68 million passengers flew within India in the first six months of 2018, according to official data, a 22% increase from the same period last year. The latest available figures from the International Air Transport Association show that India's domestic passenger traffic grew by nearly 17% in the month of May compared to the same month last year. China's grew by almost 12% in the same period, while the United States showed growth of 5.5%. The Indian aviation sector has now enjoyed double-digit percentage growth for 45 straight months. Jet Airways has responded to that spike by going on a spending spree to boost its fleet. It plans to add 225 new Boeing (BA) 737 Max jets over the next decade, of which 75 — worth nearly $9 billion at list prices — were purchased less than three weeks ago. But with several airlines competing to offer Indians cheaper ways to travel, the constant pressure on fares has made it difficult to make money. A surge in oil prices, combined with a plunge in India's currency — the rupee — is squeezing finances across the industry. "On one side your costs are going up significantly, on the other side your ability to pass on those costs is limited," said Kapil Kaul, India CEO for the Center for Asia Pacific Aviation. "The Indian market, despite having growth, has been mostly profitless," Kaul added. Dube, the Jet Airways CEO, underscored those challenges on Friday. "The aviation industry is currently passing through a tough phase given a depreciating rupee and the mismatch between high fuel prices and low fares," he said, adding that the airline has come through similar storms in the past. Jet Airways isn't the only Indian carrier that's under pressure. Profit at market leader IndiGo fell 97% in the quarter ended June, compared to the same period last year. CEO Rahul Bhatia also blamed the falling rupee and rising fuel costs. India is also having to prop up its loss-making national carrier. Since failing to sell a 76% stake in Air India to private investors earlier this year, the government has been forced to pour hundreds of millions of taxpayer dollars into the airline to keep it flying. Sad! Passengers suffer nosebleeds on domestic discount airline spawned by #India’s #aviation boom. Where are the regulators? #Modi http://www.catchnews.com/national-news/shocking-at-least-30-passengers-started-bleeding-from-nose-and-ears-onboard-a-jet-airways-flight-because-of-this-shocking-reason-133422.html A shocking incident took place after at least 30 passengers onboard a Jet Airways flight were started bleeding from nose and ears onboard a Jet Airways. Yes, several passengers were fell sick due in mid-air. The reason behind it was that the crew forgot to maintain the cabin pressure due to which the passengers fell sick and also several complained of a headache. On Thursday morning, the Jaipur-bound Jet Airways flight 9W 0697 took off from Mumbai airport. The cabin crew forgot to select the bleed switch during the take-off. Due to an imbalance in the temperature inside the flight, passengers started feeling dizzy and sick. "Thirty out of 166 passengers experienced nose and ear bleeding, some also complained of a headache," informed news agency ANI. When India liberalized its economy in 1991 and opened up its aviation sector to private players, Goyal seized his chance and Jet Airways began operating in May 1993. Over the next two decades, he grew it into one of India's top airlines, adding overseas destinations like Singapore, London and Amsterdam. "Naresh Goyal founded the company with big ambitions and good ideals in terms of developing that airline, and it established itself with a great reputation for service quality at its peak," said John Strickland, director at aviation consultancy JLS Consulting. But as millions more Indians started taking to the skies, newer players like SpiceJet and IndiGo burst onto the scene in the early 2000s. The no-frills model of the newer airlines allowed them to cut costs and drive down ticket prices, providing India's price-conscious first-time flyers with far cheaper alternatives than Jet Airways could offer with its premium service. In the years that followed, the challenges grew. India's airports became increasingly congested, foreign carriers offered stiff competition on international routes, and government taxes on fuel added to costs. "In many respects, Jet's situation reflects the challenges of the Indian aviation market altogether," Strickland said. Despite posting mounting losses and racking up debt reportedly worth $1.2 billion, Jet Airways clung on. Abu Dhabi's national carrier, Etihad Airways, bought a 24% stake in 2013, and Jet ordered hundreds of new planes to try to keep pace with growing demand. As recently as last year, it still accounted for nearly 20% passengers flown by Indian airlines. But an increasingly volatile economy — India's currency plunged to record lows in 2018, driving the rising cost of oil even higher — proved too big a hurdle, and Jet began to miss payments to staff and creditors. Things went from bad to worse this year, when the airline was forced to start grounding its planes because of an inability to pay aircraft leasing companies. "Once aircraft get grounded, and you start to go into that spiral, that's really hard to get out of," said Rob Watts, CEO of aviation consulting firm Aerotask. "You have a proportion of your fleet that's not generating revenue but is still costing you money, so the more aircraft you lose, your revenue falls but your cost doesn't fall in the same manner," he added.